In 2011 Rosa Henderson left a partner and a career in professional photography and youth events co-ordination and bought a one-way ticket to India. She wanted new directions for something useful she could contribute to the world. The experience led to her becoming a well-known earth-builder, earth-building teacher, and natural-building educational programmes facilitator specialising in clay. Rosa grew up on Milmore Downs, a third generation family farm her parents converted in the 60s to a pioneering biodynamic farm growing sheep, cattle, and grain which they milled, all of which continues today. Milmore Downs was one of the earliest farms to go biodynamic on a large scale in New Zealand; previously biodynamic growing had only been applied to market gardens. Rosa’s favourite building is one she built on the farm. She calls it her sacred place: a small round, domed temple she says has excellent vibration and resonance. These early influences meant Rosa had an intimate view of what pioneering people were like, in contrast with many who have had to recreate their worlds entirely because they disagree with their parent’s beliefs. India provided the impetus for what Rosa terms ‘journey-schooling’, based on the traditional journeyman concept wherein tradesmen served their apprenticeship and then spent three years and a day learning as much as they could from whomever they encountered. 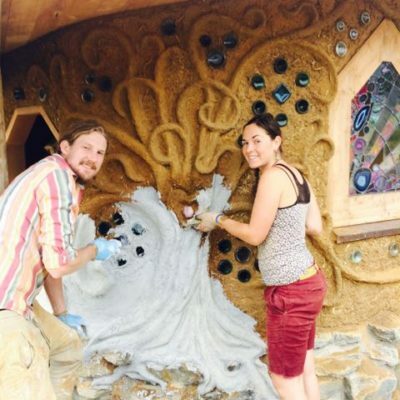 She spent two years working on, and learning about, earthship ‘biotecture’, training mostly in America and gaining a Diploma in Earthship Biotecture. 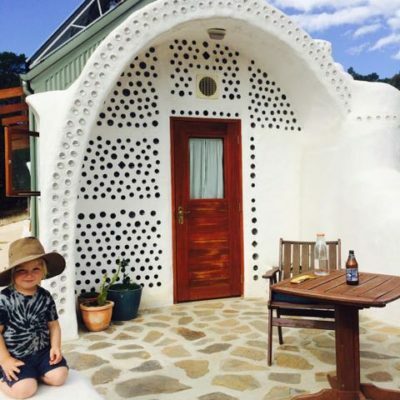 Earthships combine six elements: natural and recycled materials; catchment and recycling of water; generation of your own power; natural heating and cooling; contained septic system; and growing food inside. They are best known for the use of tyres packed with earth to form earth-sheltering walls. The diploma requires two months full-time training with the Earthsip Biotecture Academy, and work on a start-to-finish construction as part of a team, plus a final independent project. Rosa’s independent project was to bring Mike Reynolds, (American architect and founder of Earthsip Biotecture), to the earthquake recovery zone in Christchurch as an invitation to the populace to think about different ways of building in general, and to consider alternative methods of rebuilding their city. 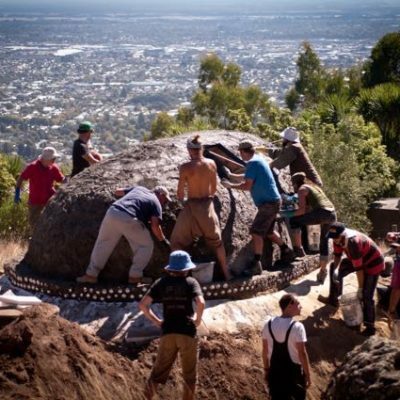 The undertaking included the construction of a small single-room earthship, managing the project and forty people who joined for a build in the Port Hills, the structure of which was completed within four days. 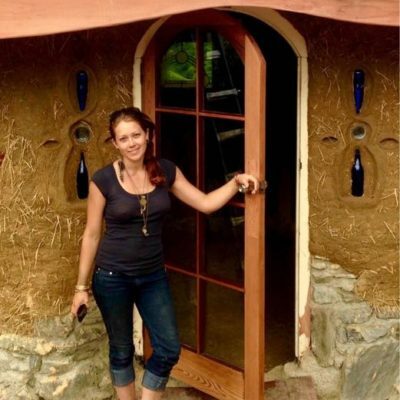 Rosa worked on three disparate international earthship projects where design for climate was critical. In the Philippines after hurricane Yolanda, the earthship was designed for tropical conditions, substantial enough to shelter large numbers of people, and cyclone-proof. Mike Reynolds designed a windship (a sloping earthship built to sustain extreme wind conditions) for them, and the resultant building has weathered everything, including cyclones. By contrast, the brief for a Malawi earthship was a community centre. Designed like an eight-petaled flower, with the centre a water catchment area, each petal was a long room accessible from outside. A Guatemalan project for a family home which looked over a hillside included three rooms and a beautiful greenhouse with flowers. Each design requirement was quite different, but all built on the same principles. 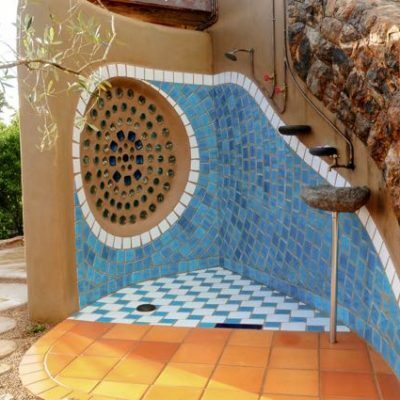 Earthships are designed for comfort in extreme hot, cold, sunny, dry climates such as the Middle East, and American Southwest deserts. New Zealand is temperate, wet, and not always sunny, says Rosa. 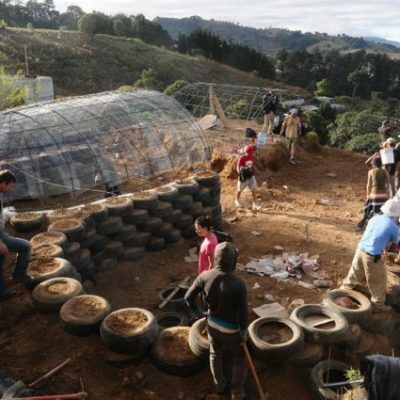 Earthships can be built for the New Zealand climate and can be really good, but require many modifications. 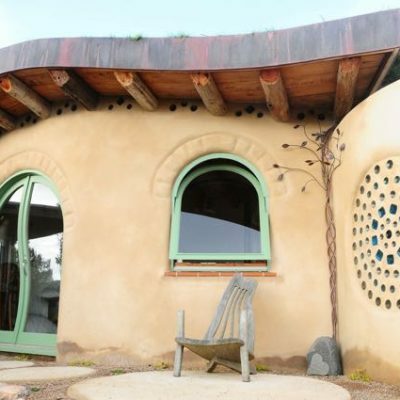 It’s easier and cheaper to design a house from scratch rather than modify an earthship designed for deserts. On Waiheke Island, around Auckland, and in Australia, Rosa was introduced to mud-bricks, and other earth-building techniques such as cob and light earth. Cob and mud bricks are constituted of clay, sand, and straw, are dense, and heavy at 1600-1800 kg per cubic metre, while light earth is made of clay and straw, with densities as low as 400 kg per cubic metre. Cob is like Play-dough. It doesn’t require form-work and is applied in-situ. Mud-bricks are formed in moulds and dried, allowing fast building. Light earth, essentially liquid clay and straw, wood shavings, wood chip or other fibre, requires form-work. It is good insulation but doesn’t provide good thermal mass, and it’s not load-bearing. Mud-bricks and cob can take all the weight of the roof, but light earth can’t. Rosa often uses light earth in hybrid buildings (part cob, part light earth). Cob goes on the north side for thermal mass and light earth on the south side where it’s more insulating. 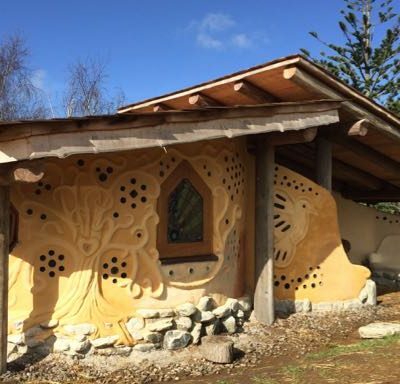 The three New Zealand earth-building standards (NZS 4297, 4398 and 4299) are currently undergoing revision and will include cob and light earth. Her natural-building design process begins with a clay model so height and ergonomic factors can be assessed. Will it allow enough light? Is it ideal for all human needs? It is as important to create an ideal interior space as it is to construct a building. Human habitats need to be strong, healthy, and beautiful, says Rosa, who admires the work of Sigi Coco (USA), James Henderson (AUS), and Verena Maeder (NZ). She refers for assistance to a global network of skilled natural builders including Graeme North, a leading New Zealand expert in the use of natural materials. 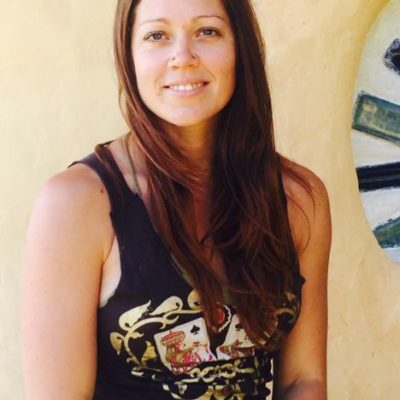 Rosa is passionate about using natural building as a medium for experiential educational environments, about devising collaborative learning environments, listening, teaching, and speaking well, and creating a balanced work and personal life. 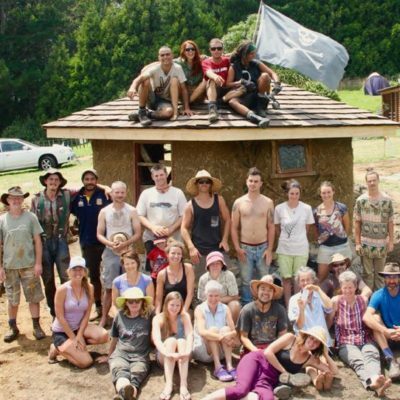 She has run annual education programmes between October and April (summer) since 2013, both as a way to complete natural buildings within an efficient time frame (needs lots of hands), and to teach skills and inspire people searching for sustainable building methods. Workshops necessitate creating temporary communities for up to 20 attendees each programme, who all learn, share, eat, and work together. At the end of a seven year cycle in which she spent the first two years on her journey-schooling experience and Biotecture Diploma, then five years working on countless projects in five countries, Rosa has taken a year off to work on a Diploma in Leadership for Change, a Building Biology and Ecology Diploma, and The Way of Nature – a programme around engaging with nature to envision new futures. 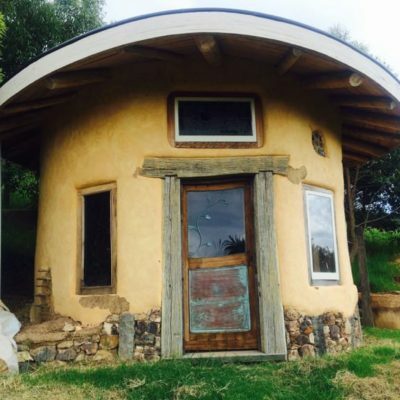 She is also constructing her own tiny home, having added facilitating tiny-home workshop/builds to her education repertoire. “I need a more diverse range of skills because my body will burn out if I continue this level of physical work for the next thirty years,” she says. Before beginning your own building, she says, start small, and work with someone on a similar build so you know whether you like it.